Posted by Eddie & filed under Military/Aircraft, Mountains & hills, Travel, February 28 2008. Last weekend Lesley and I went to Strathpeffer in Easter Ross, staying at the Ben Wyvis Hotel (which I can’t really recommend; it’s large, spooky, very old-fashioned and reminds me of the hotel in The Shining). You can see Ben Wyvis from the hotel, but the view from our room was of another wall of the hotel and anyway the summit of Ben Wyvis was shrouded in clouds the whole time we were there . We visited several places in Easter Ross, and we seemed to stumble upon more spooky places such as Clava Cairns and the Clootie Well. In Strathpeffer itself we visited the Eagle Stone (which doesn’t look like much but has some Pictish symbols carved on it) and the Touchstone Maze, which looks like a prehistoric stone circle but was in fact built in the early 1990s. After that we had a couple of pints in a local pub which probably hasn’t changed much from pictish times (it seemed to be full of warlike picts anyway). We also visited Fort George which is quite an unusual pace. It’s like a huge and unspoilt museum relic from the past but I didn’t know that it is still an active barracks and it was a bit odd to be wandering around the soldiers’ accommodation blocks; it must be a bad place to be stationed, it’s very windswept and desolate with nothing for miles around. Perhaps the most impressive site we saw on this trip was Corrieshalloch Gorge, not far from Ullapool. I’ve driven past this many times but never stopped and visited, and I wish I’d seen it before; it must be one of Scotland’s most impressive natural locations. 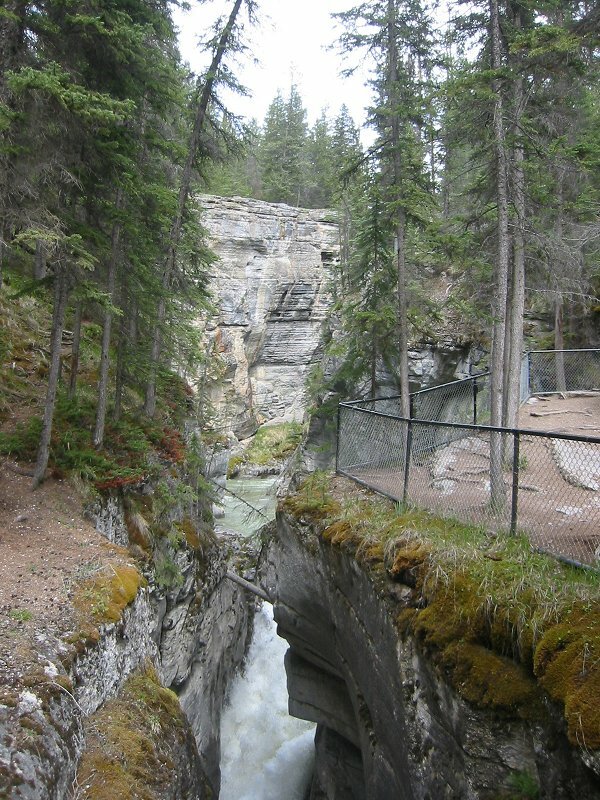 It’s an enormously deep but narrow canyon with a waterfall that is as good as anything Lesley and I saw on our trip to the Canadian Rockies last year (it’s a lot like Maligne Canyon, and was formed in the same way by a glacier-fed river). There is a bridge over the gorge at its narrowest point that provides a stomach-churning view (it’s not the most stable of bridges). We rounded off the trip with a brisk walk around Loch an Eilein in the Rothiemurchus Forest near Aviemore. This is always a great place to visit, and spring seems to be coming early here (the nearby summits had very little snow left on them). Inbetween the showers the sun was shining and it didn’t seem like February in the Cairngorms at all. You can see pics from the trip on my website here. Lesley’s blog entry about the trip is here.